It’s hard to believe, but our four week Summer Literacy Camp has come to an end. One of the aspects of the program that I am most proud of is the way the students are now responding to reading and writing. At the start of the program, many of the students approached reading and writing with some caution and reluctance – after all, we tend to shy away from activities that we believe are difficult or that we feel we are not very good at. And yet, as I walked around the room today, I found that the students were exceptionally happy and excited to read and write. This is not by accident. Through read alouds, real conversations about writing, and personalized teaching we have created an environment that values what real readers and real writers do. We talk about texts and authors we love, we re-read stories that make us laugh, we practice adding feeling and expression to our reading because we know it makes it more fun, and we talk about writing that is close to our hearts. I want to thank the Providence College Graduate Literacy students for sharing your love for reading and writing with our students – it has most definitely made an impact. Just as I did in my last post, I am going to recap some of the lessons the kids have learned and then offer some suggestions for how to support that learning at home. How you can help at home: Looking at the lessons above, there are many ways to support the work we have done. We ask students to visualize because it is often what allows students to comprehend as they read. Students who have difficulty visualizing often have difficulty engaging with the text or remembering what they read. Read aloud from a book without illustrations (such as a chapter book) and stop every few sentences to ask your child “what do you picture?”. If your child has difficulty, give him or her some examples of what you picture and model how you make pictures using the author’s words. In the same way, you can model how to make and check predictions as you read. The important part of a prediction is to use the author’s words plus what you know to make a “smart guess” about what might happen next. It’s the thinking that’s important, not whether or not your prediction came true. Before you turn the page, stop and ask “what do you think will happen?” and then read on to check or adjust your prediciton. Retelling is a tricky skill for many kids. Before they can remember and retell the events of a story, they need practice in the process of retelling, which is essentially “thinking backwards”. Start by asking your child to recount the events of the day. Use words such as “first, then, next, and last” to practice telling events in sequence. Once they seem to be able to do this easily, once in a while, ask them to retell you a story they know very well, such as “The Three Little Pigs”. Retelling is one method we use to assess if a child understood the major events of a story, yet it takes practice to be able to do this. How you can help at home: Like I’ve mentioned before, good writing almost always begins with good language. Talking with your child and using new and interesting vocabulary is a great way to prepare your child to become a better writer. This week we focused on adding details using our senses and feelings. We noticed that many kids have difficulty adding those details because they have not yet built up a bank of words to use when describing feelings or senses. They often resort to terms such as “happy” or “sad” rather than using shades of feeling such as “excited”, “curious”, or “disappointed”. When you talk with your kids about anything, notice and choose a variety of words to increase their vocabulary. Make it a challenge for them to describe things they eat, smell, taste, hear, and touch in new ways. These four weeks have been so much fun. The kids were challenged and they seemed to love it. Click the link below to watch the video and see their smiling faces in action. Reading Week is in Full Swing at NSES! Although this is a short week, it is one of the most fun ones here at NSES…Reading Week! The theme this year is “New Faces, New Places, Read!”. We have four fun filled days planned including mystery readers, a daily book swap, door decorating contest, and “Dress Like a Word” day. Here are some quick pics of Buddy Reading Day and our Book Swap as well as a link to what we have planned for the Week. Be sure to attend our Spring Reading Celebration (aka Family Literacy Night) on Thursday, April 13 from 6-7. Meet local authors, including our own Mrs. Williams and wear pajamas to listen to some fabulous read alouds! NSES Launches the 2015 Summer Reading Challenge! Yay! Today we held an assembly for all students at NSES to launch our 2015 Summer Reading Challenge! Students are challenged to read at least 60 minutes per week (or more!) during school vacation. Students who complete this challenge will be invited to a special celebration in the fall and they will have a chance to win prizes for all their effort. We also had Miss Renee, the North Smithfield Public Librarian, visit as a guest speaker to talk about her special summer reading program. All the reading you do can count for both our programs! You can check out the special public library programs and activities at NS Public Library. Look for your special Reading Log and pledge for the Summer Reading Challenge coming home today. You can also complete the reading log online using the tabs at the top of this page. Like any skill, practice makes better and reading practice is always fun. Look for our announcement about the NSES Book Swap next week…..we want to be sure everyone has plenty of books to read, read, read! 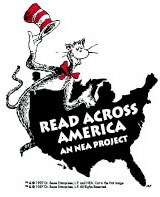 On March 1, 2013, NSES will be having our annual Dr. Seuss Family Literacy Night! Families are invited to the school from 6:30-7:30 that evening to listen to stories, make a cool craft with Mrs. McKay, and play some fun literacy games. Registration forms will be distributed to your child this week. Be sure to sign up and join us to celebrate Dr. Seuss and the magic of reading….don’t forget to wear your pajamas!